The Australia Act 1986 is the name of a pair of separate but related pieces of legislation. One was an Act of the Commonwealth Parliament of Australia. The other was an Act of the Parliament of the United Kingdom. These nearly identical Acts were passed by the two parliaments because no one knew which one had the power to do so. 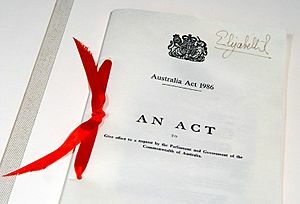 The Australia Act ended the possibility for the UK to make laws for Australia. Also the UK could not be involved in Australian government. And no one could appeal from any Australian court to a British court. Australia Act 1986 Facts for Kids. Kiddle Encyclopedia.